I have been wary of encounters with wild elephants ever since I saw a large bull elephant ram a coach full of tourists in the Kruger National Park. Don’t ever do anything to anger an elephant because they will take it up with you and if you’re driving through a game reserve in your own car will test the suspension and bodywork. Elephants in their natural state are awe inspiring and majestic creatures. Watch their sedate progress through the bush as they tear trees and shrub out of the ground to forage on, or the tenderness and care they demonstrate with their young. You’re likely to see family groups of elephants around water holes, drinking and bathing. They really do not mind drinking their own bath water. Personally I think I would object is someone had urinated in it previously but that does not seem to offend them either. An elephant at a distance is awesome. An elephant about to sit on your bonnet is simply terrifying. Be sensible and take care. Don’t get out of your vehicle or get between a mother and her calf. 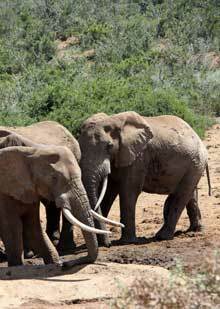 The elephant parks and nature reserves in South Africa do a good job in helping to protect elephants. Elephants in the wild are considered a pest by framers because they go on the rampage invading cultivated crops in search for food. They also eat only about 2% of the trees they tear down and can rapidly devastate an area. We need to make room for animals on this planet we share. They were there first. Addo Elephant Reserve is near Port Elizabeth in South Africa which is over 8 hours drive from Cape Town. If you wish to drive, the scenery along the route is superb and the roads excellent.